Ticket For Colin Powell Lecture Only. General Colin Powell will speak at the Carnegie Music Hall in Oakland on Tuesday, October 29th at 8:00 PM. 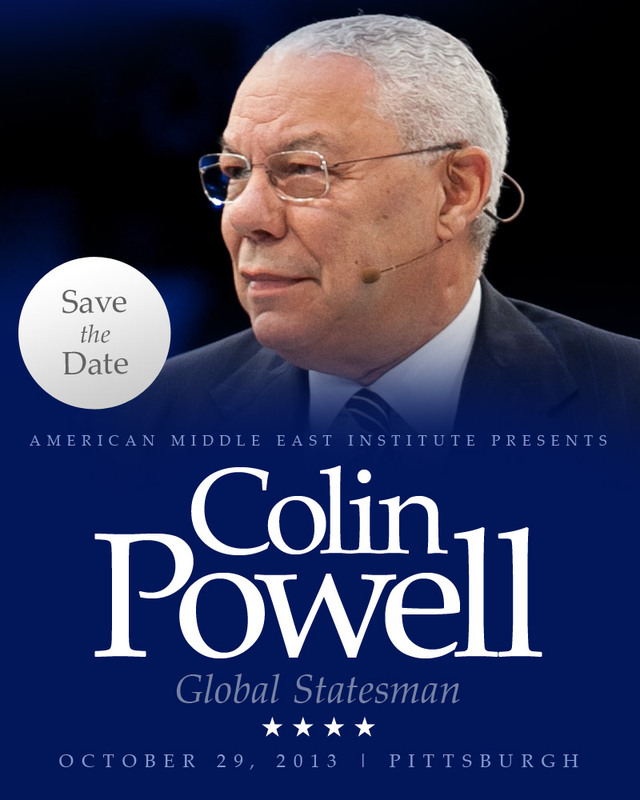 Powell's lecture will be the closing event of the day-long Sixth Annual Conference of the American Middle East Institute. Prices are $65 for the first floor, $45 for the first balcony, and $25 for the second balcony (plus handling fees). General admission seating within each level. For more information on the morning AMEI Business Conference, please visit: www.AmericanMEI.org. For information on how to register for the Water & Energy Business Conference, please contact Maria Hastings: mhastings@americanmei.org or call 412.995.0076. His autobiography, My American Journey, was a best seller and has been published in more than a dozen different languages. Powell's second book, It Worked For Me (May, 2012), was an instant New York Times best seller and reveals the lessons that shaped his life and career.